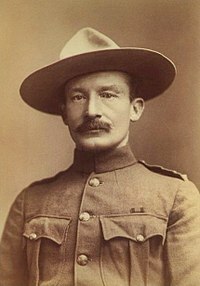 Robert Baden-Powell (B-P) was born as Robert Stephenson Smyth Powell in London on 22 February 1857. B-P was the youngest of 7 children. His father died when he was 3 years old and his mother subsequently changed the name of her children to Baden-Powell. B-P or Lord Baden-Powell, was a lieutenant-general in the British Army, and was the founder of the Scout Movement. B-P was awarded a scholarship to Charterhouse, a prestigious school. He first was acquainted with scouting skills through stalking and cooking games while avoiding teachers in the nearby woods. He also played the piano and violin, was an ambidextrous artist, and enjoyed acting. Holidays were spent on yachting or canoeing expeditions with his brothers. In 1876, B-P went to India with the rank of lieutenant. He enhanced his scouting skills in the early 1880s in Natal in South Africa, where his regiment had been posted. During his travels, he came across a large string of wooden beads, worn by the Zulu king Dinizulu, which was later incorporated into the Wood Badge training programme of Scouts. B-P returned to Africa in 1896 to aid the British South Africa Company colonials under siege in Bulawayo during the Second Matabele War. Many of his later Boy Scout ideas took hold during this war. It was during this campaign that he first wore his signature Stetson hat and scarf. During the siege, a cadet corps, consisting of boys below fighting age, was used to stand guard, carry messages, assist in hospitals and so on, freeing the men for military service. B-P was sufficiently impressed with both their courage and the equanimity with which they performed their tasks to use them later as an object lesson in the first chapter of Scouting for Boys. The siege was lifted in the Relief of Mafeking on 16 May 1900. Promoted to major general, B-P became a national hero. On his return from Africa in 1903, B-P found that his military training manual, Aids to Scouting, had become a best-seller, and was being used by teachers and youth organisations. B-P decided to re-write Aids to Scouting to suit a youth readership. In August 1907 he held a camp on Brownsea Island to test his ideas. The first book on the Scout Movement, B-P’s Scouting for Boys was published in six instalments in 1908, and has sold approximately 150 million copies as the fourth best selling book of the 20th century. Boys and girls spontaneously formed Scout troops and the Scouting Movement started inadvertently, first in the UK and soon internationally. In January 1912, B-P met Olave Soames. She was 23, while he was 55 and they shared the same birthday, 22 February. They became engaged in September of the same year, causing a media sensation due to B-P’s fame. They married in secret on 31 October 1912. The Baden-Powells had three children, one son and two daughters. In 1920, the 1st World Scout Jamboree took place and B-P was acclaimed Chief Scout of the World. Baden-Powell was created a Baron in 1929 and is often referred to as Baden-Powell of Gilwell. By 1922 there were more than a million Scouts in 32 countries; by 1939 the number of Scouts was in excess of 3.3 million. At the 5th World Scout Jamboree in 1937, B-P retired from public Scouting life. 22 February, the joint birthday of Robert and Olave Baden-Powell, continues to be marked as Founder’s Day by Scouts.In 1939, B-P moved to a cottage he had commissioned in Nyeri, Kenya, near Mount Kenya. He died on 8 January 1941 and was buried in Nyeri, Kenya. His gravestone bears a circle with a dot in the centre which is the trail sign for “I have gone home”. Kenya has declared B-P’s grave a national monument. This page was last modified on 13 December 2018, at 07:34.